I wouldn’t ordinarily call a website out like this, especially smaller sites similar to mine just trying to make a buck. However, I can’t let this go by without flagging it since the offender is such a large entity. 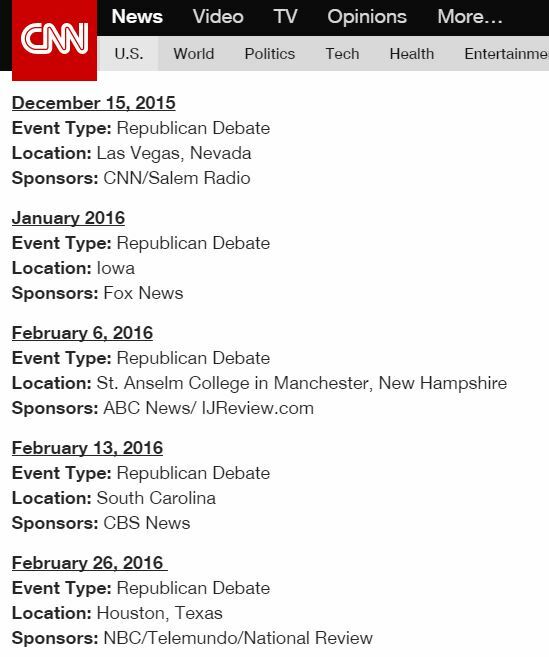 As of today, I found that CNN, the cable news organization, has blatantly lifted the content of my 2016 Republican Debate Schedule page and created a page of their own. The formatting is identical, the text is mostly identical, even the formatting of the dates are identical. They even kept the bold and underlined dates. It also resides at my partner site as it has in the same exact form for months here. Some of the text has been omitted and changed slightly, as you can see, which I’m sure was meant to obscure the connection back to this site. I’ve contacted CNN via twitter and their website contact form. I’m sure I’ll receive no reply and nothing will change, but I’m at least voicing my annoyance at the situation. If you don’t mind, hit a retweet on this tweet below and/or add a message of support, I’d greatly appreciate it. I can only assume that imitation is the sincerest form of flattery, but I’d appreciate a link acknowledging who compiled this list originally. In fact, If I can just get a link back, I’ll delete this entire post and forget it ever happened. Your turn, CNN. I’m not crazy, right? It clearly is identical down to the mundane details that I’ve gathered from dozens of sources over months. Other sites have copied some of but give credit to the source. Not CNN! The formatting is the plagiarism. Since you are stating facts, they could state the same facts and claim they used official sources, but to use your formatting shows that they didn’t do any “research.” They just did “search.” It’s yours. They need to say so. So, if imitation is the sincerest form of flattery, what does it say about plagiarism? The safest form of theft? Perhaps until the lawsuit. I agree with your first comment. PR, thanks for the backup comment over there on the WaPo page. Appreciate it. Always glad to stir up trouble in the cause of justice. Besides, I like you guys. Those bas-turds didn’t even give you the courtesy of credit or a link back?? I’m going over to complain. I used to have a website with a lot of exclusive content concerning a certain deceased model-celeb and CNN was constantly on my website stealing my content. Go get em Nate!!! Thanks for the support! I’ve complained to them directly. Unfortunately there probably isn’t much to do since the schedule itself, such as the dates, are public knowledge put out by the RNC. It’s about proving that CNN simply found this site and did a straight copy/paste which it’s obvious they did. We own the search terms for “debate schedule, presidential debates” and several others, so it would be the first site they come across. Pretty sleazy. I’m sure they take content frequently and give no credit to small outlets and bloggers all the time. Do it guys. Sue em. Make every single CORPORATION who is stealing your hard work pay for it. They make millions. That is an outrage!! !